The pretty island of Hydra is just an hour or so by ferry from Piraeus, the port of Athens. During our visit in October, temperatures were moderate with no rain. The tourist crowds of summer were gone by mid-October, so this was a perfect time to visit. A highlight of the island is the absence of motorized vehicles! No cars, no trucks, no buses. It is quiet, and the air is fresh. Mules stand ready at the port to move goods around the island. This absence of vehicles make Hydra a unique and special place. Unless you stay on the wharf, be prepared to climb up and down in the town of Hydra. 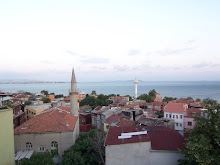 The town rises up gracefully from the seaside port. Restaurants serving traditional Greek dishes are scattered throughout the town. Some have sea and sunset views. We watched interesting quayside activity from the relaxing cafe, Oraia Hydra, where we enjoyed delicious Greek dishes served near the water. Had we stayed longer than 4 nights in Hydra, we would have ended up at Oraia Hydra every afternoon for a seafood snack and glass of wine amidst the friendly hustle and bustle. This would be a lovely routine. There are walking trails along the coast on either side of the town. More vigorous hikes take you up into the higher parts of town and beyond. Be prepared to climb up and down in Hydra, on cobblestone steps and sidewalks or gravel hiking trails. 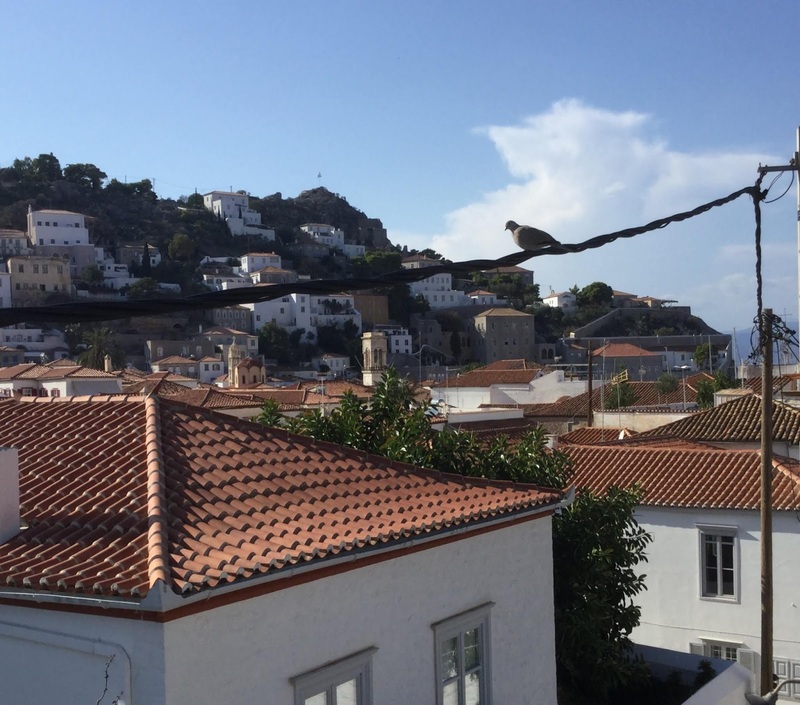 "Like a bird, on a wire" Leonard Cohen wrote the beloved song on the island of Hydra. Hydra is one of those unique places most travelers hope to visit. It's easy to get to by boat, with a beautiful port. There's a few beaches, decent shopping for tourists, tons of restaurants, lovely sunsets, good hiking and fine people. Hydra has an interesting history, too, which includes some challenging times for the residents. Check it out. Greece is, of course, the best!